Russia and Venezuela have agreed to increase cooperation in joint oil exploration projects and promised to work together to protect oil markets as well as restore prices, said Venezuelan President Nicolas Maduro during his Moscow visit. "We have agreed to step up the investment and participation of Russian companies and their share of joint ventures in the Orinoco oil belt and other projects. This will expand investments in stocks and oil production,” Maduro said to reporters on Thursday after a meeting with Russian President Vladimir Putin, adding that an exchange of technology was also agreed. The Orinoco oil and gas basin is located in Eastern Venezuela and has more than 250 oil and 19 gas fields. The world's largest deposits of heavy oil, the Junin and Carabobo are located in the west of the area. The oil fields in the Orinoco oil basin and offshore gives Venezuela the world’s largest reserves. 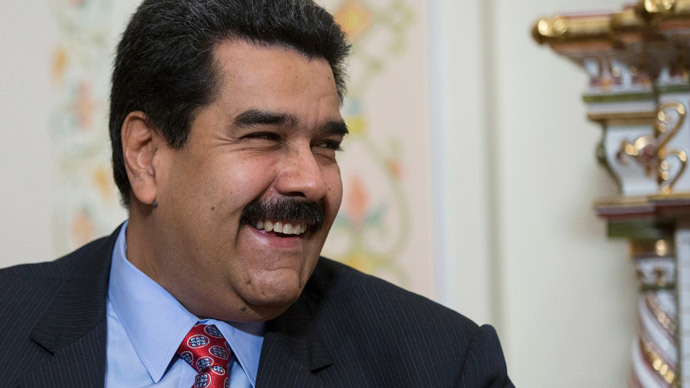 “We will also increase the share of investments as well as investment in oil production as part of the mechanism to protect the commodity market and strengthen the strategic alliance that we built in the energy sphere,”Maduro added. Maduro said he’s deeply concerned that “oil has become a geopolitical weapon used to stab the countries playing an important role in the contemporary world.” He mentioned fracking, saying that shale exploration in the US is harmful and destructive both for the natural and political environment. Russia is not the only country he paid a visit to, Maduro's trip included both OPEC and non-OPEC members, among them Iran as well as Saudi Arabia, Qatar and China where he continued “to make efforts at the highest level to recover the world oil prices." Maduro’s tour of OPEC countries shows that Venezuela wants members’ cooperation to resolve the low oil price issue. However, Asdrubal Oliveras of consultants Ecoanalitica thinks it won't have any effect on low prices. “The role of cartels is becoming less important. I think that countries must reduce their oil dependence, don’t let oil turn into a ‘headache’,” he told RT. He added the countries need to use the income they get from oil to explore new energy sources to not depend on market oscillation.